Valletta, soon after the establishment of British rule, began undergoing various significant changes. The Royal Engineers engaged upon improvements to the multitude of military structures left by the Hospitaller Knights, some of which by then were almost 250 years old. Many such alterations, carried out in accordance with the exigencies of the time, resulted in parts of the fortifications being made almost redundant, particularly those inland. Subsequently some of these walls and gun platforms were used for recreational purposes, sometimes also serving as burial grounds. The new administration coincided with the introduction to Malta of Neo-Classicism. As a style it was embraced by many of the visual arts, not least funerary architecture. Almost immediately it became fashionable for prominent military and administrative personages to be laid to rest in prominent positions on the aging, lofty battlements of the city, their memory immortalised by means of some sculptural creation. 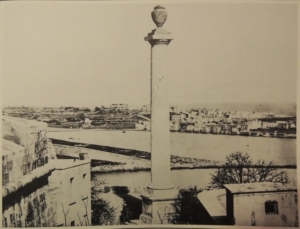 Throughout the first half of the 19th century many were the monuments erected around the Valletta enceinte. Both the Upper and Lower Barracca Gardens were favoured locations for these memorials. Here all who promenaded along the planted pathways could admire the one-time importance of the deceased, sparing a thought for their memory. Garden burials, a novelty in Malta, were a quintessential trait of English picturesque landscapes typical of the period. In 1826, General Frances Rowdon, the Most Noble Marquis of Hastings was buried on St. Michael’s Bastion not far from the erstwhile windmills. After a few years his tomb was embellished with the unusual yet graceful baldacchino structure which still stands. The surroundings were soon planted with trees and in time the former gun platform was transformed into a public garden named in remembrance of the governor. 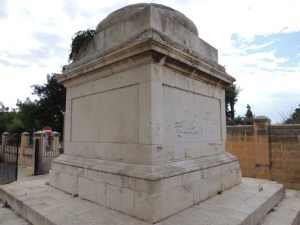 Hastings’ successor was Major General Sir Frederick Cavendish Ponsonby (1788-1837) whom although not buried in Malta, was also commemorated in this corner of Valletta, however in quite a completely different manner. Ponsonby was made governor of Malta on February 15th 1827 after having distinguished himself as a “gallant and judicious officer” whilst serving in the Peninsular War and later in France with Wellington. At Waterloo he was wounded five times, at one point almost losing his life. In 1825 he was made Major-General and the following year sent to Malta to take on the governorship. His new post however was soon relegated to lieutenant-governor in a bid to economise. His tenure is remembered for the establishment of a council of government which consisted of four Englishmen and three Maltese. This new body was the subject of some controversy even within English circles, some stating that it seriously lacked in representing true local interests. In 1830, Ponsonby’s cousin Captain Robert Cavendish Spencer died whilst in quarantine at the Lazzaretto. He was buried on a bastion just below Hastings Garden which soon was named in his honour. A grand obelisk was raised at Corradino in his memory. Clearly the original site was selected so that the whole ensemble would be visible from Strada Reale through Strada Britannica. What happened to the rest of the column and the urn is as yet unknown. The remaining stump of the monument bears marks of past restorations as well as severe shrapnel damage most likely sustained during the last war. In 2013, Bank of Valletta sponsored the restoration of the plinth. Abela, A. E., A Nation’s Praise, Malta: People, Places & Events, Historical Sketches, Progress Press, Malta 1994. Abela, A. E., Governors of Malta, Progress Press, Malta 1991. 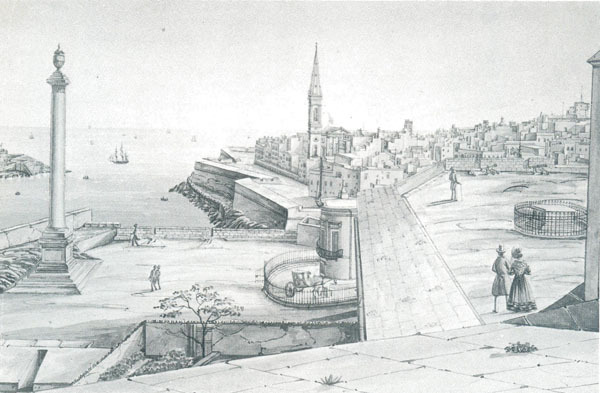 Borg, M., British Colonial Architecture, Malta 1800-1900, PEG Publications, Malta 2001. Bartlett, W.H., Malta & Gibraltar, Gleanings on the Overland Route, London 1851. 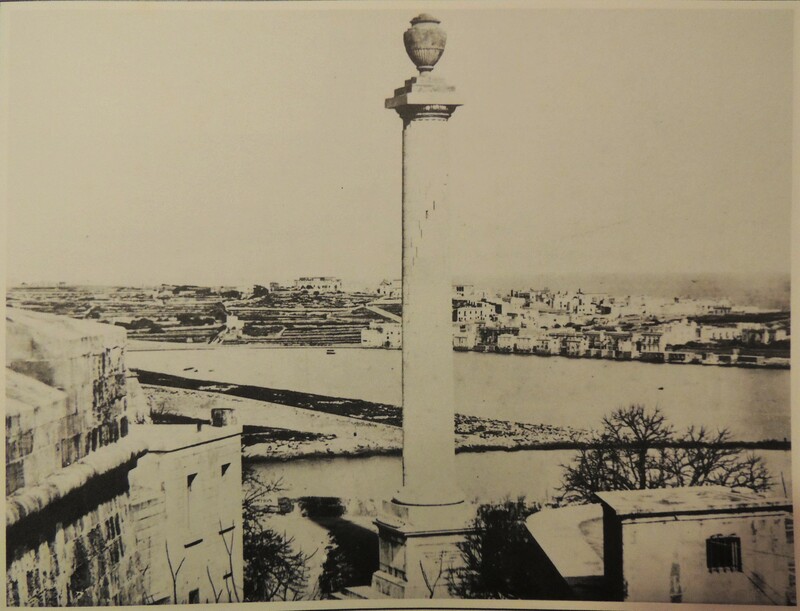 Galea, M., Valletta: Statues, Niches, Small Churches, Public Fountains, Public Clocks, Monuments and Marble Tablets, Allied Publications, Mata 2011, pp. 64-66. Ellul, M., Neo-Classic t Architecture of the Early British Period, in Heritage, Issue 26, 509-513, Malta 1979. Ellul, M., Art and Architecture in Malta in the Early Nineteenth Century, in Melita Historica, 1983, 1-19. Samuel, L. (editor), Kingston – Kingstone-Winslow, A Topographical Dictionary of England, 1848, Institute of Historical Research. Seddall, H., Malta: Past and Present, Chapman and Hall, London 1870. Simpson, D. H., Some Public Monuments of Valletta, in Melita Historica, Vol. 2., No. 2, 1957. Sultana, D., The First Duke of Buckingham and Chandos in Malta and Gozo in 1828, in Melita Historica, 2002, p. 285-290. Zammit, T., Il-Gżejjer ta’Malta u l-Ġrajja Tagħhom, Empire Press, Valletta 1925.